Taco Bell is giving PlayStation Vitas to customers every 15 minutes — except when it isn't. Over the past few weeks, the fast food chain has been running a promotional contest for Sony's upcoming handheld system. Customers can take codes found on the "Taco Bell $5 Buck Box" and enter them in a submission form on the corporation's website. If you have a winning code, you get a Vita. Or so everybody thought. Kotaku has been contacted by several customers who say Taco Bell informed them that they won the contest on January 30 (through the page captured above this post), but never followed through. They were told to expect a follow-up by e-mail or snail-mail within 2-3 days to verify that they had won. The follow-up didn't come. The affected customers have formed a Facebook group to unite and share their woes. Customers report contacting both Taco Bell and its partner on the contest, a marketing company called Ventura Associates. Neither corporation seemed to be listening. "I received no response, so I began the process of calling Taco Bell/Ventura Associates for info, where I kept being told to wait," customer Dan Hill told me in an e-mail. Hill forwarded me an e-mail exchange he says he had with Ventura's Vanessa Gross on February 2. "We have to wait 2-3 days to receive a list of winners, as that is the time it takes to process the hundreds of submissions we receive each day," Gross told Hill, according to the exchange. "Thanks for your patience." Thank you for your e-mail. We are in the process of researching your inquiry. Someone will respond to you as soon as possible. Thank you for your interest in the Unlock the Box Instant Win Game and Challenge, sponsored by Taco Bell. "I have tried two or three times to contact them, once I was reasonably sure that a first-class letter could have made it to central Florida by now, through their Facebook page and e-mail," said James Harrod, another affected customer, in an e-mail to Kotaku. "Others have used Taco Bell's helpline to little effect, or the Sony PlayStation Blog." Other customers have taken to the Facebook page to say they have received verification e-mails from Taco Bell. Customer Kevin Famuyiro says he won last Sunday, then received the e-mail this morning. As of right now, the issue seems to only be affecting contestants who won on January 30. The Unlock the Box promotion has been tremendously popular with consumers who want to get their hands on a Sony Vita but unfortunately a small group of people have tried to game the system. 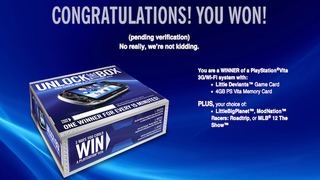 Winning confirmation codes can be verified by contacting tb@sweepspros.com or calling (855) 255-1746. When I called (855) 255-1746, I got a message saying that the company's voicemail box was full. Taco Bell did not elaborate who it thought was gaming its system or how. Further adding to the weirdness of this whole situation is the fact that anybody can see this winning screen. As of Friday, February 10, all you have to do is click this URL to be taken to a screen that says "Congratulations! You won!" So either I've just won several new Vitas or something's a little bit off with this contest. We have received your inquiry and determined that you are not a valid winner. This was determined by checking the information (i.e. code, email address, cell phone, name, etc.) you gave us with your inquiry to the data in our system's records. Please note that ANY ATTEMPT TO UNDERMINE THE LEGITIMATE OPERATION OF THIS PROMOTION AND SWEEPSTAKES IS A VIOLATION OF CRIMINAL AND CIVIL LAWS AND WE RESERVE THE RIGHT TO SEEK DAMAGES FOR SUCH ACTIONS TO THE FULLEST EXTENT PERMITTED BY LAW. We verify all winning entries and contact the lucky winners. Nearly all of the calls we've received about discrepancies have been from people who had the URL for the winner's page but who did NOT have winning entries. We are continuing to work with our customer service teams to insure that all real winners receive their PlayStation Vitas. We've reached out to Ventura Associates and we've asked Taco Bell to elaborate on its comments. We'll continue to update if we hear more information.